Application of speech robot can emulate human being to handle business procedures and save much cost in multiple business operations. In a conversation with listeners, the speech robot can go smoothly and offer them with diverse services. In 2018, speech robot has become one of the most breakthrough applications in China. The speech robot’s algorithm is a bit sophisticated: 1) the audio speech goes to Synway’s hardware (here is mobile wireless gateways) for the traditional acoustics processing; 2) the audio processed by recognition software, become machine-understandable language, through the large data comparison and retrieval; 3) the speech robot built in Synway’s products and software, conducts the speech synthesis, produces the natural voice to interact with listeners. To achieve this, speech robot also cooperate with artificial intelligence, machine depth learning and other professional technology, in order to complete the process of voice interaction. In addition, robot designers need to understand the business requirements, user needs, analyze user characteristics and behavior in order to design highly intelligent speech robot. Today's dialing is completely different from ten years ago, when OBD/IBD, a type of operational cost, only needed to answer call, check work status, implement CRM or ERP management. But now customers can communicate with the enterprise through speech robot, social media, instant messaging, video conferencing, internet chat and email. Many firms have been using artificial intelligence (AI) technology, such as having the new type of customer representative- speech robots interact with customers. Gartner predicts that by 2020, 85% of customer interactions will no longer be handled by humans, but by AI. Synway’s technologies, can efficiently handle each kind of complex voice application, and the user may quickly build intelligent platform. Synway’s Wireless Gateway and speech robot can be completely integrated in the same communication platform, mutual interaction, realizing robot intelligent capability. 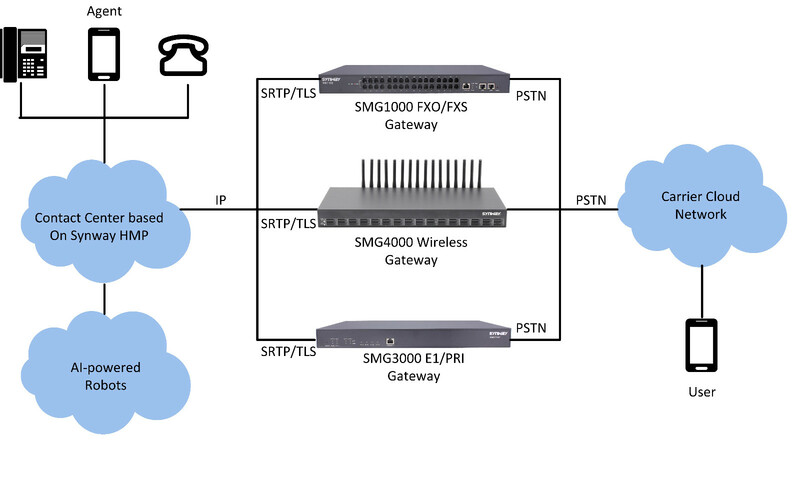 Additionally, based on VoIP technology, Synway SMG VoIP Gateway and SBC can also play a vital role in expanding power of existing communications system for future. In diverse application scenarios, AI firms, through speech robot, will embed insurance, finance, loan, power, customer service, education and other industries into server with their respective multimedia logics to realize intelligent retrieval and output. In fact, speech robot platform has greatly revolutionized contact center, OBD/IBD and made these practices more efficient. Besides, speech robot can even help companies anticipate customer behavior and provide customer service with advice on how best to address specific issues. PREV: Synway’s UC200, A Latest IP-PBX and UC System, Help SMB Build Robust and Versatile Distributed Communication System	NEXT: Special Deals Before June 8th: Synway SBC/FXO/FXS/PRI/SS7/SIGTRAN Gateway 60% Off And More!